» Changed Your Hotel Name? How to Thoroughly Update Your Brand Online. 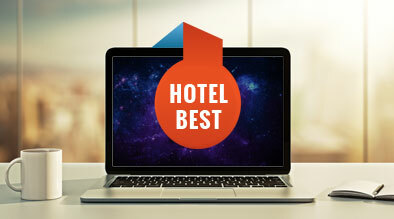 When changing your hotel name, performing a full-on web overhaul is a must to avoid harming your site performance, web traffic, and overall revenue. There are many critical steps to follow when changing your hotel’s name. Before you do, notify your internet marketing agency of the upcoming name change and coordinate with them so that they can perform a smooth transition online. Finalize the new name, address, phone number, and URL. Name, address, and phone number are fairly straightforward with updates but if a URL change were to take place, you must notify your webmaster or internet marketing agency to begin the 301 redirect process for the new URL. If you do not redirect your old site to your new site, you will lose all the backlinks that you acquired. Your online presence should always be consistent with your offline presence in order to avoid any confusion. There’s nothing worse than a hotel guest wanting to book a room at your hotel but don’t because of confusion. 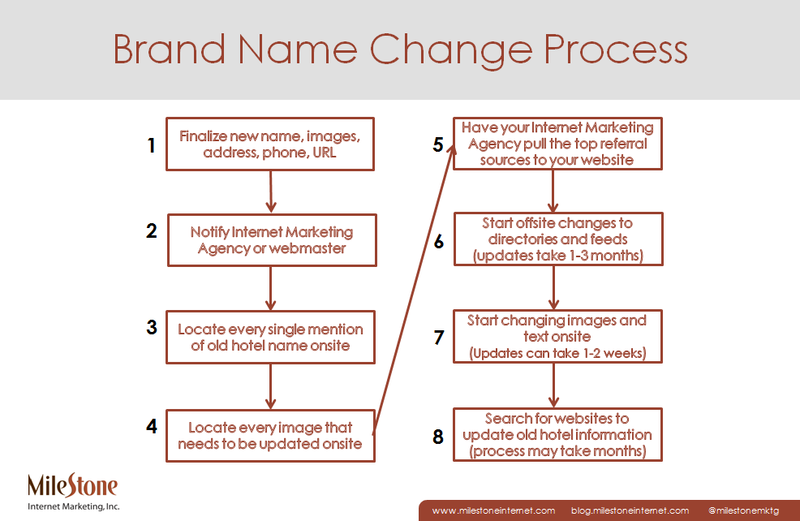 Your internet marketing agency should be able to provide a plan and a list of important factors to consider when changing your name. An easy way to accomplish this is using Google by simply searching for “site:’domain name’ + ‘hotel name’”. 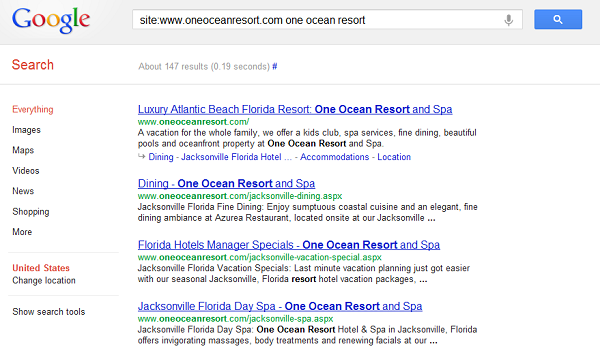 Example: “site:www.oneoceanresort.com one ocean resort” The example will give me all pages on the hotel website that the term “One Ocean Resort” is mentioned. Click through each page of your website and take note of every image that needs to be updated. Collect new photography and logos for the hotel branding. You want to make sure that you change all your top referral sources first before you begin to address all the directories that your hotel is listed on. Your internet marketing agency can help you through this process but understand that these tasks are time intensive and the changes take time to update across the web. This will decrease the delay that directories have with their listings. Coordinate with your webmaster or your internet marketing agency. Be sure to contact any directories or websites that have your hotel website listed incorrectly.